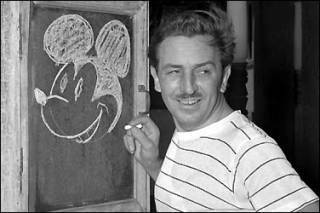 Mickey Mouse was not Walt Disney's first successful cartoon creation, but he is certainly his most famous one. It was on a Cross-country train trip from New York to California in 1927 that Disney first drew the mouse with the big ears. Supposedly, he took his inspiration from the tame field mice that used to scamper into his old studio in Kansas City. No one is quite sure why he dressed the mouse in the now- familiar shorts with two buttons and gave him the yellow shoes. But we do know that Disney had intended to call him Mortimer until his wife Lillian intervened christened him Mickey Mouse. Capitalizing on the interest in Charles Lindbergh, Disney planned Mickey's debut in the short cartoon Plane Crazy, with Minnie as a co-star. In the third short cartoon. Steamboat Willie, Mickey was whistling and singing through the miracle of the modern soundtrack. By the 1930s Mickey's image had circled the globe. He was a superstar at the height of his career. Although he has received a few minor changes throughout his lifetime, most notably the addition of white gloves and the rounder forms of a more childish body, he has remained true to his nature since those first cartoons. Mickey is appealing because he is nice. He may get into trouble, but he takes it on the chin with a grin. He is both good-natured and resourceful. Perhaps that was Disney's own image of himself. Why else would he have insisted on doing Mickey's voice in all the cartoons for twenty years? When interviewed, he would say, "There is a lot of the mouse in me." And that mouse has remained one of the most pervasive images in American popular culture.